A pretty simple formula here for this disco bluesy number. Gregg Jolly, on the other hand is anything but simple. And, anything but known, discovered or appreciated. His few and extremely rare releases are hard to come by. All of them except for this one have still evaded me. This is one of his most available recordings. I often wonder what other recordings he was a part of that didn't feature his name. His vocal style boasts that he can hang with the likes of the great Al Green. 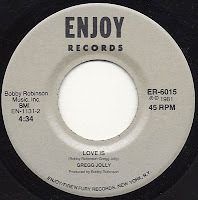 He's been showcased and endorsed by the rare groove king Tommy Stewart on another elusive 12 inch and this release saw assistance from the great Bobby Robinson and his hip hop founding label Enjoy records. It's no wonder that this had such a disco feel, and the open drum break in the middle is ripe for classic Ultimate Breaks And Beats style editing. Half way into the song Gregg really dips into his vocal soloing and almost goes Al Green ballistic. Even the title 'Love Is' feels as though it's an homage. But, even though he had less than a handful of records, he etched out his own brand of disco and funk. The drums are brutal and relentless throughout making me scratch my head thinking is that a drum machine or did they loop it? Clearly this drummer earned his keep in the studio. This oddly sounds more like 1976 than it's release date of 1981, but further proof that the blues was alive and well in the early 80's. If you are Gregg Jolly, know his whereabouts, or had anything to do with his recordings please let us know. We're madly obsessed with G-J and will do just about anything to track him or his records down. It's just another slice of funkiness I wanted to share, and as I track down his other records I will post them here. If and when I can find them, as they are stupid rare.